The DEMO on Virtual Reality Cooking. Welcome to your new kitchen. Serve your guests as a restaurant manager serving delicious food and drinks. You alone run the restaurant. You can choose between 5 different facilities, set up different day events and buy new things, food and appliances. When building the kitchens, we focused on using a smart and modern design. In the game, this is especially clear by the device. The 5 different furnishing options were created with much love and creativity in modern design. This ensures a smart design and a nice gaming environment. There are three different game modes in VRC: Full Time Manager, Arcade and Training. As a full-time manager, you have to take care of your restaurant and clientele. You yourself are responsible for the money management and the store inventory. In arcade mode, you have to serve your guests level-based food and drinks. Your restaurant is secure, so you can not run out of money, but CARA is not available. The game uses high-quality sounds to make the game feel as realistic as possible. Therefore, we also use self-made sound clips that have been specially edited for VRC. Manage your restaurant with the help of CARA (central and relieving associate). The app also shows you information about your money management. With CARA you can also set the day events and change the restaurant setup. You will also see the current number of customers and the current order. CARA is already installed on your phone in the game and ready to help you. Our game uses a 4-page menu. 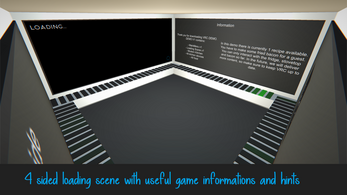 On the four pages you will find the start page, the settings, the controller configuration and the credits. 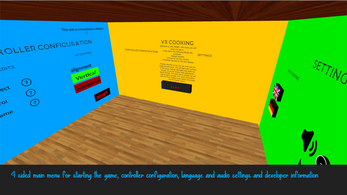 VRC is the first VR game with such a main menu. You can set your own controller control, unlike the other mobile games. You can do this in the main menu in the Controller Configurator. The game is available for Android devices running Android 4.4 and higher. For an optimal gaming experience we recommend a device with 3GB of RAM, but fewer are possible. Make sure you have a VR controller to get the most out of VRC. The game requires a VR glasses or Cardboard glasses. We recommend in-ear, on-ear or over-ear headphones. Please keep VRC always up to date, so you will not miss important updates. We use music from NoCopyrightSounds in VRC. NoCopyrightSounds, also known as NCS, is a UK-based music organization and record label that publishes copyrighted music. VR Cooking was created with Unity. Unity is a cross-platform game engine developed by Unity Technologies and is primarily used to develop three-dimensional and two-dimensional video games and simulations for computers, consoles and mobile devices. Convinced? Then download the game now.